MP Automatic Vertical Air Jet Cleaning Machine work on positive air pressure & vacuum cleaning. The unit is made compact, versatile and enclosed in stainless steel elegantly matt finish body, consists of S.S. Slat Conveyor & Reciprocating cleaning nozzles. No container No cleaning system arrangement is standard features of the machine. 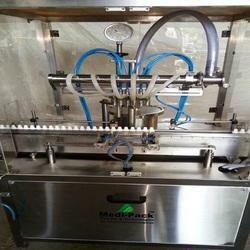 Automatic Vertical Air Jet Cleaning Machine can accomplish a task by a photoelectric system, all the bottle should be cleaned before being filled, when an empty bottle arrives at the specified position, a cleaner comes down automatically until at the mouth of the bottle, then pure air is pressed into the bottle, and the impurity inside of the bottle is removed by vacuum system. This product conforms to the requirements of GMP completely. Description : MP Automatic Vertical Air Jet Cleaning Machine work on positive air pressure vacuum cleaning. The unit is made compact, versatile and enclosed in stainless steel elegantly matt finish body, consists of S.S. Slat Conveyor Reciprocating cleaning nozzles. No container No cleaning system arrangement is standard features of the machine. The main drive of the machine and conveyor drive consist of A/c Motor with synchronized variable A/c Frequency Drive. Operation : Automatic Vertical Air Jet Cleaning Machine can accomplish a task by a photoelectric system, all the bottle should be cleaned before being filled, when an empty bottle arrives at the specified position, a cleaner comes down automatically until at the mouth of the bottle, then pure air is pressed into the bottle, and the impurity inside of the bottle is removed by vacuum system. This product conforms to the requirements of GMP completely. Salient Features : • Positive air pressure and vacuum cleaning. • Easy operation. • Adjustable diving type cleaning nozzles. • Automatic loading and unloading of container. • Individual control for air pressure and vacuum cleaning. • Higher capacity blower to clean properly. • S.S. pressure meter. Electrical Specification**0.5 HP / 415 Volts / 50 Hz. 0.5 HP x 2 = 2 HP / 415 Volts / 50 Hz. MP Automatic Vertical Air Jet Cleaning Machine work on positive air pressure vacuum cleaning. The unit is made compact, versatile and enclosed in stainless steel elegantly matt finish body, consists of S.S. Slat Conveyor Reciprocating cleaning nozzles. No container No cleaning system arrangement is standard features of the machine. Electrical Specification** : 0.5 HP / 415 Volts / 50 Hz. 0.5 HP x 2 = 2 HP / 415 Volts / 50 Hz. Adjustable diving type cleaning nozzles. For the diverse requirements of our prestigious clients, we are engaged in providing Air Jet Bottle Cleaning Machine. 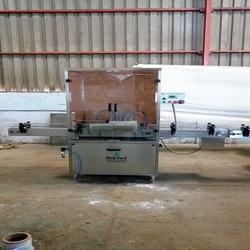 This machine is available in compact designed finish and comes with height adjustment legs for adjusting of machine height. This multifunctional multi featured machine meets the GMP requirements of washing for glass and plastic bottles. Our machine is appreciated for its easy operations, stationary stainless steel nozzle options, automatic loading and unloading of container, adjustable height & pneumatic operation. Electrical Specification** 0.5 HP / 415 Volts / 50 Hz. 0.5 HP x 2 = 2 HP / 415 Volts / 50 Hz. 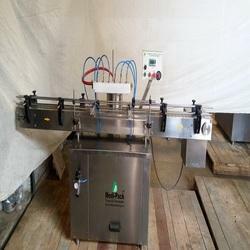 Being the reputed organization, we are engaged in offering a quality array of Automatic Vertical Air Jet Bottle Cleaning Machine that comes in compact design finish as well as come in stainless steel matt finish body finish for lasting service usage. This machine features ac motor based main drive and conveyor drive so as to provide for reliable and consistent performance. Our machine is known for its features like easy operations, adjustable & diving type cleaning nozzles, automatic loading and unloading of containers, high capacity blower for optimum cleaning support among others. 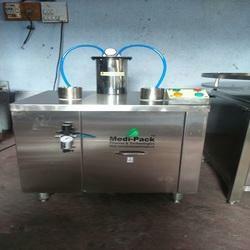 We are one of the leading manufacturer and suppliers of Air jet bottle cleaning machine. We obligated to meet the quality standards as per the client's requirements.